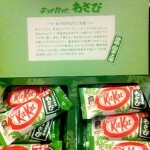 Review: Wasabi Kit Kat | Oyatsu Break! Visitors to Japan will, for the foreseeable future, be able to easily and cheaply locate Wasabi Kit Kats for the foreseeable future. 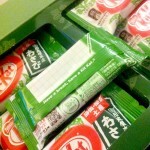 Once the unique Japanese Kit Kat flavours became known outside of Japan to foreign travellers, souvenir shops at Narita Airport began stocking Wasabi (alongside Soy Sauce and Green Tea) Kit Kats in earnest. This is a blessing and a curse—it’s great that you can try a unique, Japanese flavour of a Western snack food easily and affordably, but this is now the low-hanging fruit and very rarely do souvenir shops try much harder than this to stock some of the new and different flavours. 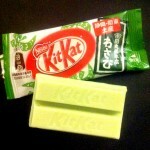 But is this the fault of the Wasabi Kit Kat? No, but it does make me a little cranky at it. Wasabi Kit Kats really are the perfect food souvenirs of Japan; they’re something you can’t get anywhere else, something unique and strange and incongruous, and ultimately they’re really tasty if you can force yourself to give them a try. Packaging: JAPAN! 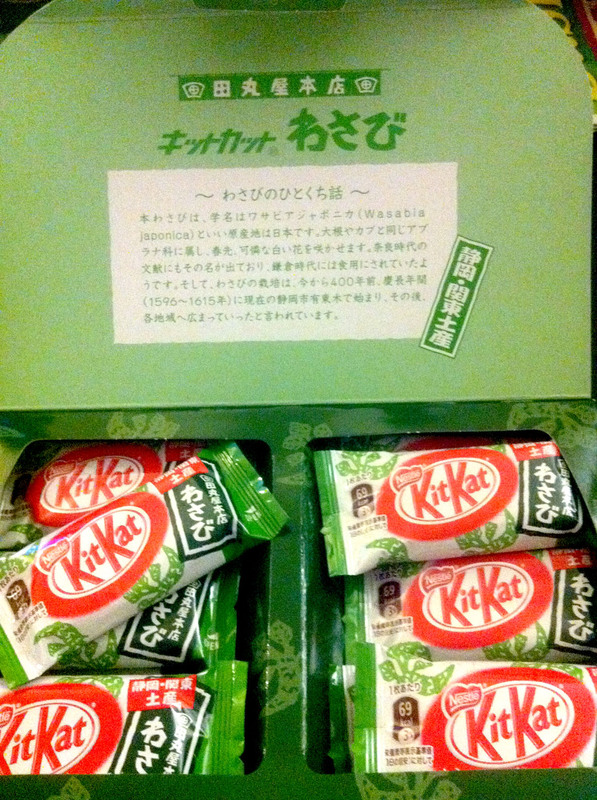 The deep green back-drop really pops the bright red Kit Kat logo, and the adornment with a rice paper pattern dotted with chunky brushwork drawings of wasabi root? Fantastic. Lots of big, prominent Kapanese characters are also quite nice for a souvenir, but flipping to the side of the package and seeing “WASABI Flavour” written out to be absolutely clear about the contents is appreciated. The interior features the Kit Kats laid out in a standard gift-set, with 12 mini 2-finger Kit Kats included. The interior Kit Kat packaging features a lovely upgrade over the previous editions (this was not my first package of Wasabi Kit Kats): an area to write a message to the recipient. Whether it was an inspirational message or just re-writing out the type of Kit Kat in English (there’s no English lettering on the individual packages). Nice. 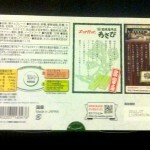 The box interior and exterior also feature messages, one presumes about wasabi and/or Kit Kats, written in Japanese. While these are made in Japan primarily for a Japanese audience, you can’t deny the power of these as a souvenir and it’d be cheap, easy, and satisfying to see Nestle include a little paper insert with a translation of this text for international audiences (English, Korean, and Chinese would do it). Scent: Much like the Soy Sauce Kit Kats, Wasabi smells very, very sweet. It’s made with the standard ‘white chocolate’ Kit Kat candy coating, and that is pretty much all I get out of smelling this particular Kit Kat. It actually smells a bit like play-doh. Taste: First, I took one of fingers and just popped the whole thing in my mouth. 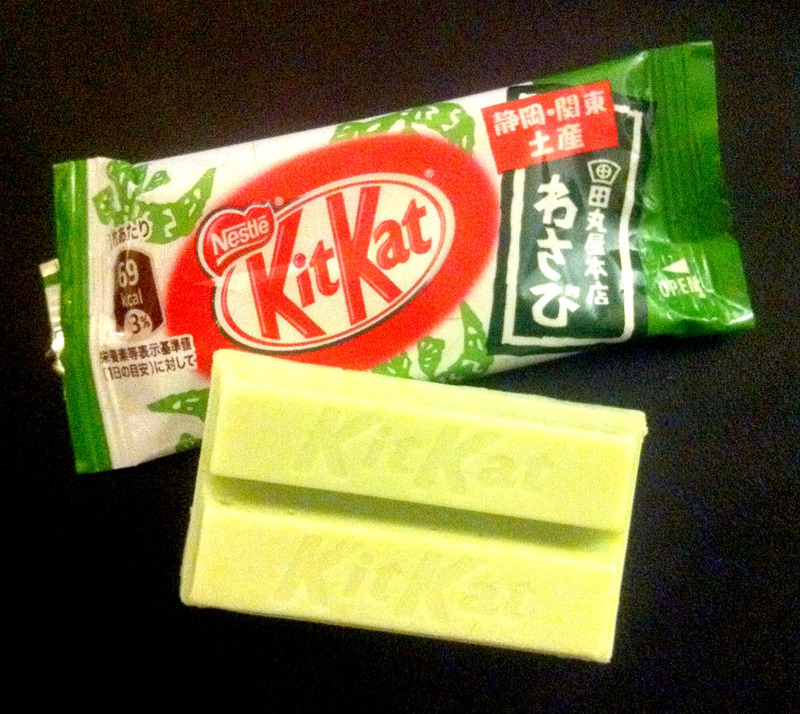 While I’ve had some pretty fresh and pretty stale Kit Kats in the past, this particular finger sitting out at room temperature had a nice, quick, clean hit of wasabi flavour surrounded and eventually entirely coated by the typical white-chocolate taste. I asked my husband to try a bite as well, and he was disappointed with the amount of Wasabi flavour, he wanted much more. I’ll also say that while there was a hit of the taste of wasabi, so far as I could tell, there was none of the heat that usually accompanies it. Taking a tip from my dissection of the Soy Sauce Kit Kats which yielded spectacularly different flavours, I decided to try and eat these Kit Kats piecemeal. First I bit off all of the white chocolate coating on the sides of the Kit Kat. 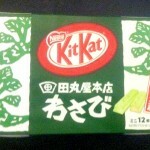 As I anticipated, there’s no wasabi flavour at all in the chocolate coating, just some green food dye. What remains are the wafers, and a thin spread of cream in between them. Biting into them, you get that hit of wasabi flavor again, with no real heat. In fact the wasabi flavour there isn’t notably stronger than when you bite into the chocolate as a whole, it just lasts a bit longer. 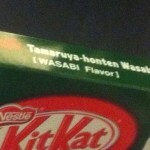 Verdict: It’s a wasabi Kit Kat, and wasabiphiles are honestly going to be a bit disappointed with it. Given all of the amazing chili and chocolate creations that skilled chocolatiers have invented over the past few years, I’m sure there’s an amazing wasabi, chocolate, and wafer creation out there just waiting to be made. This isn’t it. But for visitors and the timid, folks who find their little tastes of wasabi to be eye-watering and fearful, the folks back home that you can share 12 little chocolate bars with? 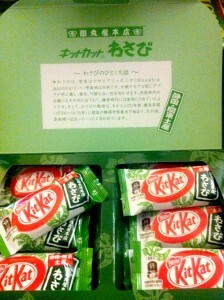 They’re all likely to find Wasabi Kit Kats to be an absolute treat, just ‘spicy’ enough to satisfy.